Furniture Pads and Shrink Wrap | Which Items Work Best? If you’re preparing to move, you probably know that the process requires a lot from you. You need to dedicate plenty of time, money and patience to the process. You’ll also need to buy plenty of supplies. It’s pretty common knowledge that boxes are a major component of moving. But what should be used to protect larger items that don’t fit in boxes? Here’s a look at two of the most prominent options: furniture pads and shrink wrap. Shrink wrapping is immensely popular in the manufacturing and shipping industries. Electronics and several other items that consumers order and purchase come ensconced in cellophane to protect the items from damage. This wrapping can also be used to keep items don’t fit in boxes from being damaged during a move. Shrink wrapping is tempting to use for moving because it’s both airtight and adaptable. The clear plastic can fit tightly around items and prevent moisture or dust from infiltrating them en route. Wraps can also be cut and tailored to fit your items almost precisely. Still, you shouldn’t use shrink wrap for every item that you can’t pack in a box. Here are some issues with shrink wrapping. -Wraps are most cost efficient when used in moderation; if you wrap all your furniture in them, you’ll likely need to buy quite a bit of it. -It can also be difficult and time-consuming to wrap items properly. 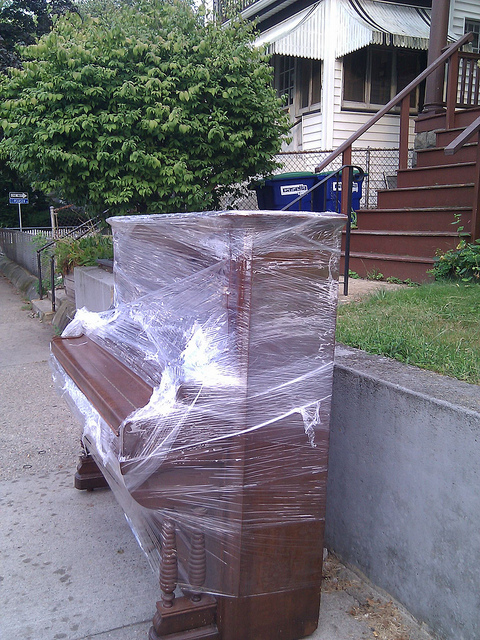 Movers will often offer to shrink wrap items, but they might charge a pretty penny for this service. Garrett’s has a different approach to this service, and believes that shrink-wrapping is important for many pieces. Garrett’s standard service includes complimentary shrink wrapping. We will shrink wrap pieces INSIDE your home to prevent damage from occurring. -Since wraps are made of cellophane or plastic, they can be a bit slick. This can make it difficult to carry items to and from moving vehicles without dropping the items and damaging them. -If moisture does get through the wrap in some way or form during a move, the wrap can trap it against the surface of the item it’s protecting. This means that even a small amount of moisture can cause big problems for your possessions. -Shrink wrapping often must be cut or torn to be removed. Since it clings so tightly to the items it protects, it’s easy to damage the item during the removal process. -Shrink wrapping is rarely reusable. This means lots of wrap must be thrown out after a move. Furniture pads are protective pieces of felt that can be wrapped around items to protect them. Since these pads are either thickly built or quilted, they can absorb much of the force of anything that bumps into them during a move. Furniture pads are often wrapped around an item and secured with packing tape. Since they’re not airtight, moisture that makes its way to the inside of the pads can move around freely and escape, without causing as much residual damage to wrapped items as it would with shrink wrap. It’s also easier to grip furniture pads than it is to hang on to shrink wrap. Furniture pads are also very efficient, which makes them popular with movers. Pads can be used for multiple moves, since they’re simply wrapped around an item and secured with packing tape. 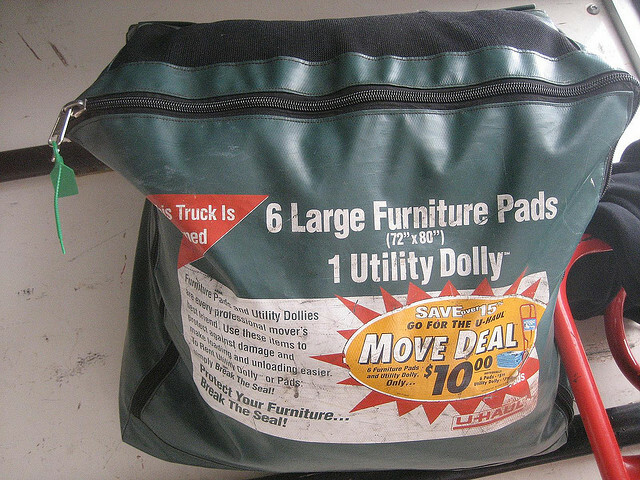 Many movers (including Garrett’s Moving and Storage) will bring their own pads for a move, and self-moving companies will often provide pads with a rented truck. (In both cases, the pads are returned to moving companies or self-movers once the move is complete). One disadvantage of furniture pads is that they aren’t adaptable. Pads have a particular size; if they can’t wrap around an item entirely, you’ll need to use multiple pads to secure the item. Which Method Works Best for Wrapping Items? It depends which items you’re wrapping. Shrink wrap is best for items that are upholstered (such as mattresses, office chairs and sofas. It’s also best for items that are oddly shaped, since the wrap can pretty much conform to the shape of the item its wrapping. On the other hand, furniture pads are best for items made out of solid materials, such as metal or wood. It’s also good for furniture that’s taken apart and then reassembled, such as a dining room table. Ultimately, use your judgment to decide what items you should use to wrap items that can’t be boxed. In a typical move, it would likely be most beneficial and cost efficient to put some items in shrink wrap and surround others with furniture pads. If you’re looking to move, go with Garrett’s Moving and Storage. We’ve moved thousands of satisfied customers across the Dallas-Fort Worth Metroplex and across the United States since 1992. For a free moving estimate, click here or call 972-487-5843. This entry was posted in Stress Free Moving Tips and tagged furniture pads, moving, shrink wrap. Bookmark the permalink.